Welcome to my corner of the web! Please follow me on Facebook, Instagram, Pinterest and Twitter! I’ve been cooking a lot of fish lately. I find myself craving more and more seafood, fish specifically, and less meat. Don’t get me wrong, I am a meat lover and will never give up eating meat but for right now, it’s all about fish! I picked up a couple of King Fish steak and had no specific plans on how to cook them. 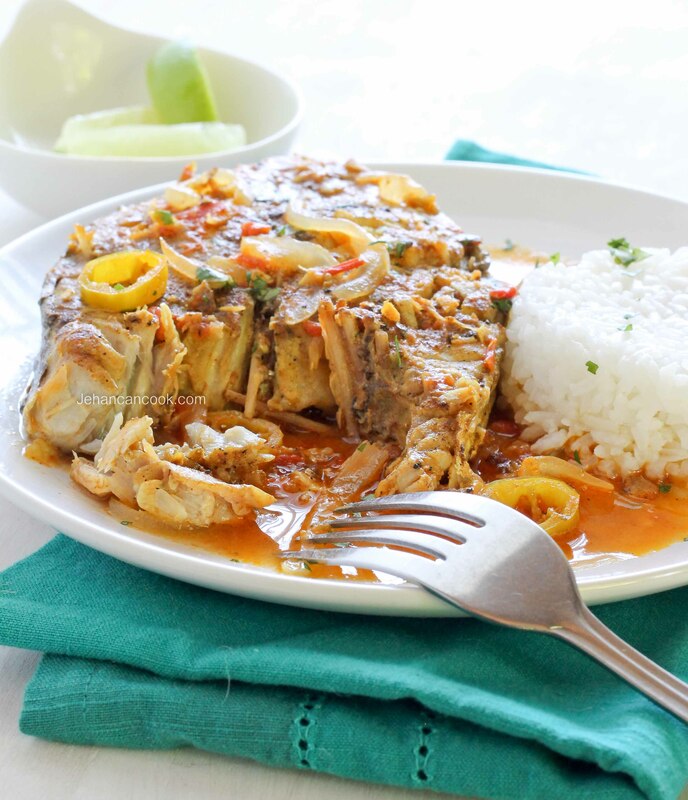 King Fish is a firm fish and holds up well in stews. In an effort to test new recipes for this blog and for my very first eCookbook, I’ve been frying a lot lately so I knew I didn’t want to fried fish. Yes that’s right! I am working on an ebook that will have brand new recipes and a few very popular ones from the blog! It’s something that I’ve been pondering for a while and I finally think the time is right! More details on that soon! I decided to stew with the King Fish. I seared the king fish that was seasoned with turmeric and cumin then I added it to a slightly tangy sauce that had a splash of lime juice and vinegar. This was served with rice and steamed green beans and it was good! Craving satisfied! Place fish in a large bowl and add the juice of a lime, then fill with water so that it covers the fish. Let the fish sit for 10 minutes. Drain the fish then pat dry. In a small container mix cumin, turmeric, chili powder, black pepper and ½ tsp salt, then sprinkle on both sides of the fish. Place a heavy bottom stew pot over high heat. Add oil, when oil is hot add fish and brown both sides, about 3 minutes per side. Remove fish and place in a plate. Add butter, onions, tomatoes, tomato paste, garlic and ginger and cook until the vegetables soften, about 5 minutes. Next water, thyme, pepper, remaining salt and vinegar then bring to a boil and allow to simmer for a few minutes. Carefully add fish back to the pot and cover. Lower heat to medium low and allow to cook for about 10-12 minutes. Remove from heat and garnish with a splash of lime juice and freshly chopped cilantro. Serve with rice. This looks AMAZING GOOD! All the flavor in this just lets me know it is going to be one flavor explosion. Pinning! Yum – this literally made me drool! 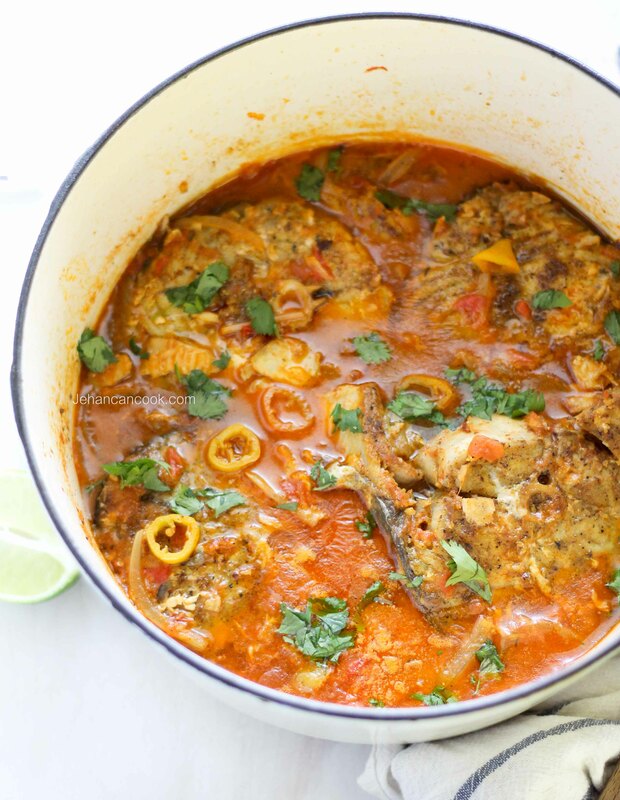 We’ve been craving some fish curry, and this is a winner. Can’t wait to make this for my kid-foodies! 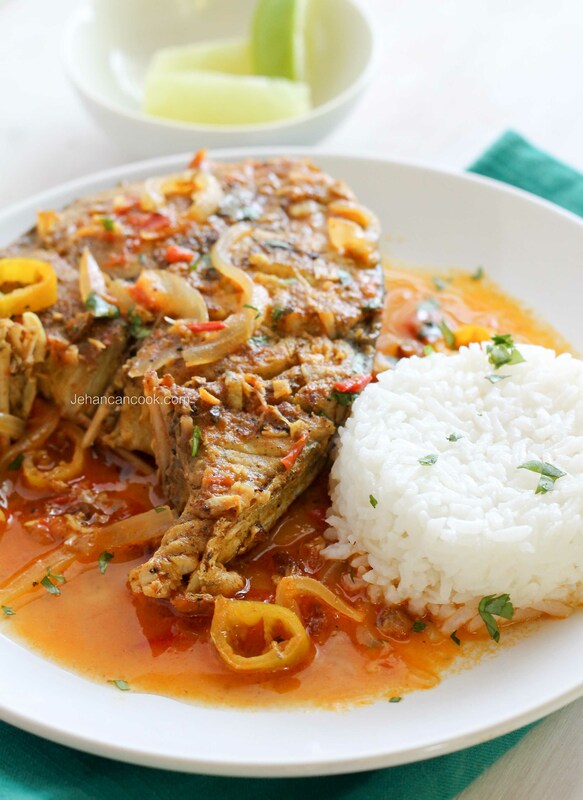 Where can you purchase King Fish and is there another name for it? I live in Maryland. Thanks! Hi kisha, I don’t know of any other name, sorry. Kingfish in Asia and Australia is known as Yellowtail in the US. I caught some down in Mexico and am going to give this recipe a try. I am going and try this recipe with a different fish. Hope taste as good.